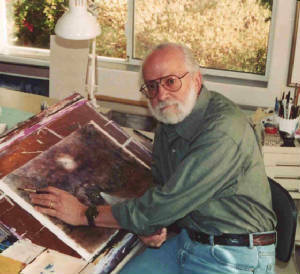 Lew Lehrman spent three decades in commercial art before escaping in 1984 to become a full time watercolorist. In the two decades since then, he has also been an instructor, author of six books on art, and an avid traveler. In 1999, Lehrman founded The Haunted Studio, creating art and fulfilling commissions for watercolor paintings for an unexpectedly large and continually growing year-round audience of haunted and Halloween art aficionados. PG: I've been familiar with your work for nearly a half-decade now, but give Lily's readers a little background on the artist, professionally known as Lewis B. Lehrman, if you please. LL: Well, I remember creating art as early as kindergarten, believe it or not. I will always remember Mrs. Levy, who saw my interest, and encouraged me to create a "project" in the classroom. Though I can no longer remember what it was, it was obviously enough to keep me enthused about creating art. I regret that Mrs. Levy, and all the other teachers who helped guide my growth, never knew how much they meant to me. Mrs. Kreisberg, who taught me through 4th and 5th grade, took me (along with several of my classmates) to her sister's apartment in Manhattan one snowy day. Her sister was a professional watercolorist, and I watched in awe as she created a painting right before my eyes. That was it! I was hooked. In high school, I learned perspective drawing by the book. It's a skill that has served me well ever since, and I don't think it scarred my creativity one bit. I went to Carnegie Institute of Technology (Today Carnegie Mellon University) for my undergrad degree in Graphic Arts, and took a few more art courses there. After a stint in the army, I got a job with a publishing house, and started taking as many fine arts courses as I could cram into my after-work day. These classes were at New York's famous Pratt Institute art school. I'd rush from work several evenings a week, bringing my passion to find out what being an artist was all about. I did this for over 4 years. Couldn't care less about a degree, just wanting to gather all the insights, pick up all the skills I could. In 1958, I started a freelance graphic design business. Jack-of-all-trades, I designed, illustrated, and produced all sorts of printed materials. My firm (later in partnership with my wife, Lola) became the leading designers of printed graphics for the Hotel and Restaurant industry. In 1984, we got out of that business — happily, I might add — and moved to the Berkshires of Western Massachusetts, where we renovated a 200-year old house, and turned a collapsing barn into a dream studio and art gallery we called The Gallery At Mill River. That was when I began painting full time. PG: What prompted you to begin painting haunted houses? LL: I got started because of a little Halloween painting (one of a number I was then doing from time to time) I had done for our gallery. This must have been in the late '80's. Color Xeroxing had just become available. I made some prints of this painting, and sold them along with other prints of my pen-and-ink art at our gallery. In the process of moving to Arizona in '93, the unsold prints were packed, forgotten, and rediscovered six years later when I brought everything home from the studio I'd been renting to the one we'd just added to our house. At that time, I was just beginning to sell on eBay, so, on a whim, I listed the print. It was snapped up at a better price than I'd hoped for. The same happened with a second, then a third copy. One of my buyers pointed out something I'd never suspected: that there were a great number of people out there who love Halloween, and love it all year around! She suggested that I could sell more of these and recommended that I get in touch with a Halloween-centered clearinghouse web site she knew of. I emailed to its webmaster, attaching sample images of this painting and another I had done. He told me that I should have a web site, and offered to host it in exchange for prints of future paintings. When I thanked him, I let him know that I knew zilch about creating a website. He suggested another person he thought would do that for me on the same basis. I was off and running! The name, "The Haunted Studio" just came to me. It was a natural. When I went to apply for a URL, it was there waiting for me — a good omen! PG: Which was your very first "haunted" painting? LL: My first painting for The Haunted Studio was "Nine Spooks," and the painting was purchased by an artist friend of mine here in Arizona. I had to borrow it back to scan it for The Haunted Studio print edition. PG: Have you painted your own house? LL: I've painted our former home in New England several times, but never as the haunted house we know it to be. I painted it a couple of times as a night scene in the snow, and once as a day-lit autumn scene. PG: Do you sketch first, or go straight to canvas? LL: Well, I use watercolor paper, but I know what you're asking. I almost always begin with a pencil sketch, often several. And follow that up with a watercolor sketch to prove my design, and to see how the composition moves my emotions. Sometimes I publish these sketches in The Halloweenist, my free monthly newsletter, which now goes to several thousand fellow Halloween enthusiasts, in search of feedback. I like to look for reactions and thoughts from Haunted Studio fans. PG: Is watercolor your preferred medium? LL: It is! (Thank you Mrs. Kreisberg's sister!) I have always loved it, and for many years struggled to master it. I estimate that since 1985, when I began painting in earnest, I have done maybe 3,000 paintings, though many were failed efforts which I destroyed as soon as I realized that they'd gone off the rails. Now I have a backlog of experience, and I'm reasonably certain that what I start, I can usually complete to my satisfaction …though not always! PG: Have you ever thought about doing a haunted version of a national landmark, oh, let's say ... the White House? PG: While painting from a photograph, have you ever gotten a sense that the house you're painting truly is haunted? LL: Sorry to disappoint you, but no, that usually doesn't happen. A photo is just a cold, static image. However there have been instances, such as when I painted "The Enduring Mysteries of the McPike Mansion," when I did have the feeling (reinforced by time spent discussing the project with Sharon Luedke, who is restoring this historically haunted house in Alton, IL, and who showed me some very spooky photos!). PG: Have you done any illustrative work for writers and/or publishing houses? LL: Not in this life! I don't really want to do illustrative work. Illustration is a pain. At this stage in my life, I'm able to paint what I want, when I want, and that keeps me happily busy. No art directors looking over my shoulders, no deadly deadlines. Been there, done that. Three days before leaving for Peru, I received an inquiry from an art director in Las Vegas, who thought my style would be perfect for a Halloween party invitation he needed for a casino-hotel client. When I saw the deadline and the budget, I was tempted to tell him that if he'd triple the time required and the budget, I'd take it on. It's nice not to be hungry. PG: Are there other art forms you dabble in? LL: As for medium, I stick to watercolor. However, every so often I embark on a series that has come to me out of ... somewhere! Layered constructions, watercolor paper sculpture, miniature screens. During the years 1989 - 2002, while keeping busy with art, I also wrote six books on art, for artists. PG: Lew, just when I thought I knew it all, I've discovered that you are also an Art Instructor — tell us about that. LL: I have taught watercolor classes for the past dozen years at The Scottsdale Artists' School here in Arizona, and workshop classes in artistic travel journaling for the last 5 or so. Artistic travel journaling is a particular passion of mine. Whenever we travel, I bring along a sketchbook and pocket watercolor kit, and sketch and add commentary whenever possible along the way. Teaching is how I learn. With twenty years of serious painting, and between 3000 and 4000 paintings under my belt (some good, some failed, a few great), teaching demands that I think through the process of what I now do almost instinctively, so I can explain it to someone struggling with painting number 5. Teaching also affords me a captive audience before whom I can be stand-up comedian, commentator, and conveyor of the excitement I experience washing color onto paper. PG: For my own selfish reasons, I am especially interested in your recent trip to Mexico — particularly with Dia de los Muertos fast approaching. LL: Understand I'm no authority, but my impression is that the Mexicans' concept of Dia de los Muertos (Day of the Dead) is quite different from ours. Their concept of death is not scary — it's reverential. They take that time to celebrate the deceased. Whole families go out to the gravesites of departed parents, where they bring food offerings, picnic at the site, clean and tidy up the gravesite, and generally celebrate their lives. A very wholesome attitude. All of the DDLM artifacts, the grinning skeletons, skulls, tableaux, etc., are really very humorous and jolly, if you look at them carefully. The practice, I surmise, is a pastiche of pre-Christian and Christian rituals and beliefs. We saw much the same during our visit to Peru. There, Dia de los Muertos is also celebrated, but (as far as I could tell) in a much more subdued manner. PG: Getting back to the art, tell us about your commissions. LL: An aspect of the Haunted Studio, which I enjoy immensely, is working with people who'd like their home (or a grandparent's home, or the home they grew up in) painted as a haunted or Halloween scene. I can't recall exactly how I came to do the first one, but the idea seems to strike a chord with many visitors to the website. In the five years The Haunted Studio has been online, I've completed more than forty, and these days I generally have five or six in the works at any given time. Every one is different, and I look forward each time to the challenge of taking a gaggle of daytime, summertime (and occasionally wintertime) photos, my client's description (real or imagined) of their house at Halloween, or in a projected state of haunted disrepair at sometime in the future, or transported to the midst of a ghostly cemetery — and creating a painting they'll be excited with and treasure as a family heirloom. One of my favorites was commissioned by a man who sent me an assortment of old and new photos, and a faded old snapshot of four kids, perhaps ranging in age from 4 to 9, sitting side by side on a doorstep. He was very specific in his desires, telling me what fun the family would have at Halloween each year, when they were young, as he dressed up as "Egor," stalking them around the house, to squeals of laughter and fright. He asked if I could put Egor in the front window and the four kids at the bottom of the porch steps. When he'd approved the finished painting, he asked me to run prints of it to give to his grown children, married now, with kids of their own. "At Thanksgiving, my Dad said he had a great Christmas present for all of us. He usually gets us something strange so I didn't give it much thought or even try to anticipate what it may be. (He isn't good at keeping a secret either so looking back on that conversation, I am even more surprised he didn't sneak me a peek of what was to come on Christmas day.) My siblings and I opened your paintings at the same time and we were all instantly crying. Our childhoods were spent in that beautiful house and to see it painted and us sitting on the step was so incredibly special. Then, after looking closer to the amazing details we see Dad/Egor in the window, the meaningful title and also our grandmother in the painting. More tears were shed! I recognized your work instantly as Mom and Dad also have your Strange Light painting hanging in their house. It is Halloween year round there as Dad is a collector of haunted houses and ghoulish items. It's not surprising your work caught Dad's eye! I can't thank you enough for capturing cherished memories and painting them as you did, Mr. Lehrman." That letter, more than anything, exemplifies why I find continual pleasure, not only in creating these commissions, but in just about everything that has to do with The Haunted Studio. PG: Share the music you listen to while painting. LL: Interestingly, I don't usually listen to music. When working in my studio, I usually have National Public Radio talk programs on. I enjoy the intelligent conversation they provide, through the likes of Terri Gross, Diane Rehm, and others. Not only do they keep me in touch with the world, they somehow prevent me from over-intellectualizing the instinctive task of painting. When I do opt for music, I'll load the CD changer with opera, symphonic, popular music of the Gershwin, Cole Porter, Rodgers & Hart era, and whatever else appeals to me at the moment, as I marvel at the incredible creativity each artist represents. LL: go back to writing." LL: the art of writing narrative fiction"
PG: Long range plans — where do you see yourself in the year 2015? LL: One of the pleasures of my little enterprise is its free-form nature. I'm on a pathway that's leading somewhere, and I am content to follow where it leads me. In 2015 I'll be 82. Who can plan for 82? I enjoy the mental stimulation of what I do. It keeps me active and interested. It helps finance our love for travel. If it ever gets to be anything less than fun, I suppose I'll hang it up. PG: And we hope you never will. Thank you, Lewis B. Lehrman, thank you for keeping Halloween 365 days a year. Wait — here's a question for me: "Ebenezer Scrooge is to Christmas what Lew Lehrman is — why, to Halloween, of course! Lily © 2005 All rights reserved.